Roger Ebert: John Hughes’ son remembers another Chicago legend. John Hughes’ son on Chicago without Ebert. Chicago is a city of neighborhoods. Even though my street is surrounded by the foot traffic of a major university, a public zoo, and an occasionally bustling city park named for onetime inhabitant L. Frank Baum, it still retains the proverbial personal touch of the mailman stopping to chat when you cross paths. When my family first moved in, we were greeted with what would become a common refrain. “You know, Ebert used to live on this block,” the mailman said. The grocery store on the corner? “Ebert used to shop there,” neighbors would say, unprompted. One day my wife saw Bill Kurtis strolling down the block. “Must’ve been at Ebert’s,” I thought, realizing the name game had afflicted us all. Unlike Harry Lime, one of Ebert’s favorite cinematic ciphers, his presence was too large to simply fade into the shadows of a neighbor’s doorway. 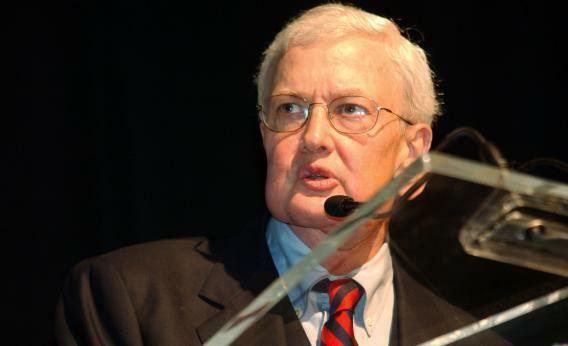 Though his opinions reached a worldwide audience, Ebert’s presence was felt in this neighborhood more than any corner, or corner balcony, on Earth. His byline loomed large throughout the city, and will for some time, I imagine. It was one thing to dip into his Twitter feed, as nearly a million followers routinely did, but it’s another to have held onto some of his Sun-Times clips from decades past, stashed in folders from my days growing up in the Chicago suburbs. When I was away at college and a major movie event was in the news, upon returning home my parents would inevitably have the weekend arts section set aside for me, ready to be appreciated in print. Often it was Ebert who had the final word. I’ve written about the city for Slate on occasion, and when my editor asked me to consider an appreciation of Ebert, I expressed some uncertainty. One memory in particular shot to mind, informing but by no means clouding my judgment of Ebert’s remarkable contributions to print journalism and film preservation. I was browsing in a bookstore in Manhattan in 2000 when I encountered the cover for his latest release, a collection of negative reviews titled I Hated, Hated, Hated This Movie. The third Hated was in all-caps, seared in as if by a branding iron. And there was Ebert front and center, raiding Macaulay Culkin’s wardrobe, hands slapped to his cheeks in the iconic Home Alone pose. (It’s worth noting that Ebert reserved his harshest critique for the film’s Lost in New York sequel.) It was a harmless joke, and certainly one that effectively telegraphed the book’s contents at glance, but I confess the image had a certain bite for this Illinoisan. It was a memorable morning in 1989 when my family was scrambling to get ready for the car ride to O’Hare for our first overseas vacation when my father, John Hughes, disappeared into his office to sketch out an idea for what would happen if the youngest member of the family was left home alone. Now living in Manhattan on my own a decade later, there was Ebert, staring back at me from Chicago, rubbing it in from afar. As it was for Ebert, remaining rooted in Illinois has been a constant in my family. Returning to the Chicago suburbs was the goal from the moment we moved to Los Angeles in the mid-’80s, when my father’s workload mandated proximity to Hollywood studios. He often spoke of one particular moment of clarity when he knew his run as a Californian had come to an end. He was walking in the backyard when he froze in his tracks, unable to remember whether it was summer, fall, winter or spring. He couldn’t recall the day, the month, the year. With that, we relocated to Illinois and my father was shooting his films in spacious suburban high school gymnasiums instead of studio back lots, just as he had when he began his directing career. And sure enough, having left the scrutiny of the Hollywood press behind, there on the doorstep every morning were the Chicago papers boasting the bylines of the two most iconic film critics of their generation, now maintaining an even closer watch. The passing of Gene Siskel was one of Ebert’s many midlife challenges, as any admirer knows, and as a fellow Illinoisan, Siskel’s loss was palpable. Ebert’s courageous battle against cancer and his reinvention as a digital-age portal of good taste and companionship was a masterstroke still rightfully receiving toasts around the world. In adulthood, and certainly as an inhabitant of the sliver of Chicago that claimed him, my respect for Ebert’s range has only grown. (No hard feelings on the book jacket.) How could I do anything but praise his 1970 Esquire piece, in which he shadowed a staggeringly drunk Lee Marvin? Or his ability to mentally reconstruct the pleasures of eating a Steak ’n Shake cheeseburger bite by bite from his hospital bed after the removal of his jaw? Or the time on Letterman when he drummed the “William Tell Overture” on an unimpressed New Jersey woman’s screen door? But for me, no contribution was more humbling than his eloquent explanation for why Planes, Trains and Automobiles deserved a place in his list of Great Movies. Few essays I’ve ever encountered have hit as close to home. I had the opportunity to thank Ebert in person only once, which led to an intermittent email correspondence. At a screening in Chicago in 2011, my mother and brother and I approached him to acknowledge his kind tributes in the wake of my father’s passing in 2009. Upon hearing our family name, Ebert patted the silk scarf draped over his heart and reached for his pen. Like any good film critic, he could scrawl a legible note even in dim theater light. “I visited the set of The Breakfast Club,” he wrote, patting his heart once again. Looking back at his Sun-Times column from that visit, it’s remarkable how much it captures the tone of the set (a high school gym, naturally) and the collective focus of the cast at a time when they were still finding their footing. Welcome to Des Plaines, Ill., the column seemed to be saying. You’re far from the city lights: Time to work. It was a pleasure to eavesdrop on the on-set interview between Roger and my father, frozen in time. The quotes rang true, capturing the casual way my father would talk in the kitchen late at night or while poring over a pile of records. There was a light touch to Roger’s prose as well. I could detect a tinge of relief as he settled into a story that was only a short car ride away, far from the pressures of filing dispatches from an international film festival. The reason for that sense of comfort is simple. The two of them were at home.